I had worn this net Chikan saree here and here earlier. But yesterday it was worn with a different blouse pairing. Read below some very interesting facts and research about saree how and why it keeps us warm during winters and cool in summers. How saree acts like a thermos flask and gives us insulation. No wonder it has been our attire even before the times of Mahabharata. It was the garment for Apsaras (Goddesses and fairies). It is a garment that makes you stand out in a crowd. It is something that is most admired in the world. And if you are looking for photo ops, nothing can beat a saree. So if you are travelling to beautiful locales and want Yash Chopra movie like photographs, do pack in your sarees. For many Indian women today, the sari is more an outfit for rare, dressy occasions than utilitarian daily wear. Better the pre-stitched convenience of trousers or salwar kameezes than the fumbling that comes with six-yards of freeform fabric. Yet, a new study by a Riyadh-based researcher of Indian origin turns the idea on its head, showing that the Indian sari scores over western wear on at least one aspect of convenience – insulation. Much like a thermos flask, the sari has the ability to keep its wearer warm or cool, depending on the weather around her. 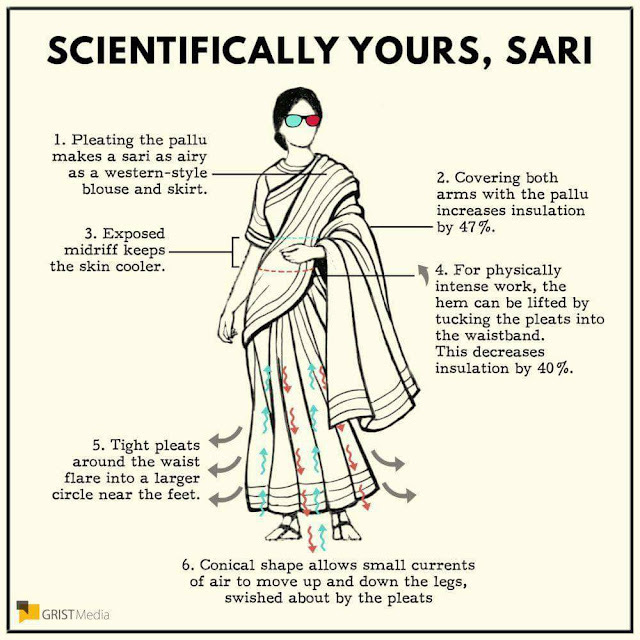 It’s all in the pallu, the study shows. Depending on whether you pleat the pallu or drape it across your shoulders, you can alternate between the warmth of a sweater and trousers or the breeziness of a summer skirt and blouse.